The music is all fresh and the playing superb. The First Suite (1977) is the most melodic and direct. The Second Suite (1979, epilogue 2000) is more of the same, but not so tightly constructed. The Third Suite (2000), which opens the disc, is the thorniest, with the most abstract melodic material and asymmetrical rhythms. Yet you sense you are in on the composer's deepest thoughts. These three guitar suites present a convincing fusion of many styles and attitudes—blues-inflected harmonies sit comfortably alongside diatonically oriented flamenco figurations; minimalism with the Classical languages of Sor and Carulli. There are also spiritually borrowed moments from such Latin American composers as Agustin Barrios-Mangoré and Carlos Guastavino, often leavened with quite natural jazz syncopations. That last element, however, is subsumed into contexts that bring Bach’s sonatas and partitas for solo violin and solo cello to mind—works that were, in their time, inspired by the age-old impulses to sing and to dance. Lewis’s guitar technique is utterly clean and precise. He has a fine understanding of his comparatively quiet instrument’s paradoxically awesome dynamic range. His chord voicings are organ-like, and his ability to float his often-austere melodies over large time stretches is satisfying. The sound is state of the art. In sum, if you are a guitar aficionado, this release is essential. Guitarists spend so much time alone that it is no wonder the music they play often expresses deep yearning for communication with the outside world. 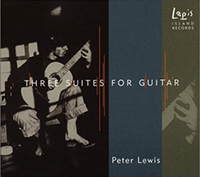 Peter Lewis’ three suites for guitar are personal and introspective ruminations that occasionally compel the listener to feel twinges of guilt for crashing the private party. But the pieces are also appealing and subtly coloured, so the guilt quickly morphs into appreciation. Lewis composed the first two suites in the late 1970s, when he was under the influence of guitar masters and teachers Alirio Diaz and Carlos Barbosa-Lima. Even so, these pieces only momentarily bask in Spanish influences, instead embracing impressionistic harmonies, recitative-like phrases and borrowings from Northwest Indians. The Third Suites, written in 2000, isn’t light years away creatively from the earlier pieces, but its languished sighs, asymmetrical metres and motoric elements, complete with dashes of flamenco spices, are vivid and entrancing. Lewis’ music exudes songfulness, as when he tries for exuberance (as in the “Burlesque” movement of the first suite, which is based on a tritone), he sees the dark side of things. The composer plays his own scores with all the urgency and commitment one would expect from a performer who knows the music from the inside out. There isn’t a wasted gesture or hesitant moment in these interpretations, a rather remarkable feat for an artist who hasn’t appeared in public since 1985. The intimate acoustics enhance Lewis’s restrained virtuosity. Five Page Feature Article Published. Peter Lewis is featured here as the soloist in his own four-movement Three Suites, works that show off the formidable technique Lewis commands — his right hand is particularly amazing, capable of the most fleet-flowing repeated notes. Tuneful and highly rhythmic, the suites (especially the last one) have an improvisational feel, with repeated passages that alter slightly and gradually metamorphose into completely different material. The writing exploits the guitar's resources very stylishly. The guitar suites are wonderfully haunting. I remember what Stravinsky said about the guitar: not small but as from far away. The music brings those distances home. I’ve listened to it over and over. Bravo! Amazon US, Canada, UK, France, Germany, and Japan. For additional domestic and international sales and web sites, please search Froogle and Google. In addition, there are direct links to iTunes and Amazon.com on the Recording Contents Page. These CD's are also available in stores. Lapis Island Records is widely distributed through City Hall Record Distribution (United States, Canada, and Mexico), and internationally by IODA. It is also sold as an import in various countries. Both New Albion Records and Theodore Presser Company publications are widely distributed throughout the world. Please refer to those companies for any additional information. Please note that Lapis Island Records has non-profit status through the San Francisco Study Center, it’s fiscal sponsor. Therefore any funding assistance is welcomed and appreciated. Recent Grant: Argosy Foundation, for River Shining Through CD.